The holiday season is a way to celebrate good times together, to feast and exchange gifts. It may also mean having to meet those not-so-friendly relatives, missing the ones who are gone, or being left alone thinking everybody else is having a great time. In winter, when there’s a frequent shortage of direct sunlight, it’s easy to get a little depressed. Christmas and the New Year can bring on a load of stress as well. It’s a time to reflect on the year you’ve had and on what’s coming for the next. All these combined may trigger a binge eating fest where comfort and stress play into your emotional eating at the same time. Even if no compulsive eating is at play, eating a lot during the holiday season may be the way you bring back good memories, feel at home, or connect with family or colleagues. It’s as if overeating during the holidays has been approved by tradition. Your brain may unconsciously associate this period with eating sweets, bakery delights, and other fattening foods in vast amounts. So how do you avoid overeating and weight gain during the holidays? Failing to avoid overeating may cost you weeks, if not months, of feeling embarrassed with your body and guilty for eating too much and being overweight. The first thing to do is to acknowledge that you learned as a child that food, sugar, and sweets were a normal part of Christmas parties. If you’re longing for those moments when you were the child being pampered or taken care of, overeating is a way to reconnect to that missing past. The same thing is true if you’re depressed and yearning for a taste of Christmas. First, think of all the foods that you have unconsciously attached to Christmas. Is it pudding? chocolate? ice cream? gravy?… Make a thorough list of all the foods, the sweets, and the beverages you associate with the holiday season. Now, look at your list and see if you can find a better way to rekindle the spirit of Christmas. Ask yourself, “Is this the best way to enjoy the holiday season?” It’s OK if you hear yourself say, “Yes.” Now ask yourself, “What would be a better way to enjoy the holidays that would make me feel even better?” And then wait. You may have to wait for a few hours, but keep asking yourself the same question over and over. Once you’ve come up with your inventory of possibilities, consider that you don’t have the same bodily needs or the same metabolism as a child, and that it’s normal not be able to process the same foods the same way now as you did then. Now think of all the things you’ve found that can help you connect with that Christmas feeling without eating. This will work whether you had great Christmases in the past or you never had the Christmas of your dreams. If your Christmases were disappointing, sad, or scary, now is the time to give yourself a great one. You have no power over the past, but you are very powerful over what you can do with it in the present. I have taught you how to overcome food addiction by nurturing yourself, now is the time to apply this skill. Ask yourself, “How am I going to make this Christmas the best ever?” You can even be on your own and have a great Christmas. Now, think of all the things that will make you feel good and proud. Maybe it’s saying no to extra pudding; maybe it’s staying centered and quiet even if your parents are getting on your nerves as much as ever. What will make you feel proud, satisfied, fulfilled, and happy—other than food? In other words, plan for a great Christmas. You can’t control your relatives or circumstances, but you can control your reactions with adequate planning. React in a way that will build your self-esteem. Now that you have picked two to three things you would like to have happen at Christmas, sit down, transition into deep breathing, and close your eyes. Imagine that you see your Christmas just how you have planned to have it. Enjoy seeing yourself behaving exactly the way you want to. Do this every day twice a day, including Christmas eve and Christmas day. That’s called visualizing a mind movie. You can do the same thing for every holiday season. Plan for success. Your success means that you behave the way you want to; you behave in a way that makes you feel really proud and happy; turn it into a movie in your mind that you replay over and over throughout the day. As you have created and repeated your mind movie over and over for your family reunion, you can now expand the idea to all holiday parties. You can create an affirmation for that. For example: “This is the best holiday season. I’m so proud of me. I’m an adult now. I eat moderately and I enjoy myself.” Or something shorter: “I love being at ease and in control at holiday parties.” Meditate on your success, and repeat your affirmation as often as needed. You know you have done great when you stop hearing self-defeating prophecies or your inner critic: “You’ll never this or that” or “You should have…” Keep practicing as needed. Do this a few days before and during parties. It may sound like silly advice but I always recommend that you “eat healthy first,” even if you eat “unhealthy” after that. It trains you to make the right choices over time. Of course, don’t eat if you’re not hungry but if you are a little start with some raw vegetable like celery stick, carrots, cucumber, salad. This trick only works if you’re a little hungry and if you eat raw vegetables. I know some people will starve themselves for a couple of days to compensate for previous days of overeating, and then they will indulge again. If you’re already a binge eater, your body has had enough of this yo-yo dieting practice. You only put more strain on your system and end up gaining even more weight. If I’ve had too much, I drink leek soup with very little potato or no potato, but I usually don’t skip a meal. If I do, I drink a lot of water but I don’t remember skipping two meals in a row. No matter how much I ate the previous day, I eat if I feel hungry. I invite you to try the same this year. I know it may feel a little scary not to fast or diet. But fasting is just going to keep you stuck in the diet-binge-diet cycle and make gain even more weight in the long run. Dark chocolate will curb your appetite. Do not eat it at the beginning of a party or it may temporarily suppress your hunger, only to leave you famished three or four hours later. If you are addicted to chocolate, use three unpeeled almonds instead—this step is optional if you know you can control the amount of dessert you’ll have. According to recent studies, guilt-free enjoyment of what you eat seems to be the secret for staying thin. It’s the guilt overeating the wrong kinds of foods that is keeping you fat. As long as you don’t overeat every day, it’s OK to eat a bit extra occasionally. I eat cheese cake, chocolate fondant, and even burgers once in a while. I do it with great pleasure, but I always stage it so that my brain remembers it’s only for special occasions. If you have 20 holiday parties, choose the one that matters the most to you, and make that the one where you will have the most pleasure through eating. Eat moderately during the others. Train your brain to learn that indulging is OK, but only during those very special occasions that you choose deliberately. Also, try to eat normal portions on a plate sitting at a table if possible. Eating nibbles and small portions end up making you eat more because it doesn’t seem as satisfying to your brain. First, follow all the advice above. 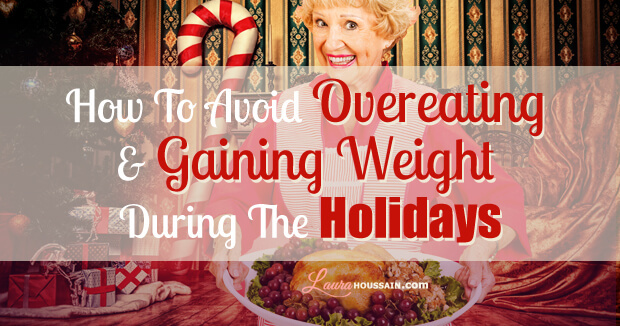 The guidelines I’ve outlined will help you prevent binge eating and are smart ways to avoid festive weight gain. And that’s not all. Go for the turkey, but avoid the pastries, and limit the amount of alcohol you drink. I absolutely love champagne, and I will have one too many glasses once in a while—and that means about four times a year. I often have just one glass a week or one every two weeks and no other wine. If you can’t limit your intake during one night, then avoid grains for a week after that and dramatically cut your sugar intake. If you’re not sure how to do that, I have written on how to stop eating sugar for you. You can mix up to one tablespoon of apple cider vinegar per glass of water. Drink before going to parties and before going to bed. It will help you detoxify faster and digest better. You may use it regularly for twenty-one days after the holiday season to cleanse your bowels. If you do so, make sure to drink a glass of water once or twice every hour for eight hours. The water from tea, coffee, and sodas doesn’t count. Drinking more water will help you keep a flat belly, especially if you drink organic apple cider vinegar along the way. Alcohol, sugar, coffee, and starchy foods leach minerals and water out of your body. Make sure to be fully hydrated. Drink one to two glasses of water per hour in between meals. Water helps prevent cravings as well. Avoid drinking water during meals. It will make it harder for your stomach to digest food as water will buffer its acidity. A recent study has shown that daily exercise prior to Christmas dinner could limit its long-term effects on your weight. That’s probably because it temporarily boosts your metabolism. If you follow all my other guidelines, you may gain some weight for a few days but lose it quickly. That’s why I say this step is optional. I think it’s a good idea to exercise all winter to prevent depression and limit winter weight gain. You can exercise daily for two weeks after the holidays for an extra boost as long as you’re not telling yourself that you can have more cake during dinner because you’re going to exercise later. Please see my article about compulsive eating and diets for more details. Eat a few raw almonds, some fish, spinach salad, broccoli, avocados, and coconut oil. Most of the above food recommendations contain metabolism-boosting foods that will help you control cravings. Apply these guidelines for every holiday season and every big event in your life, such as attending a wedding, and you’ll avoid gaining weight and overeating without feeling deprived. You can still have a little of everything. Also subscribe to the newsletter now. Enter your name and email and click on the Get it now button. I will send you more tips and techniques weekly. I’ll show you how to stop compulsive eating, lose the weight gently and effortlessly, feel fabulous and irresistible, and get the life you want. It’s super powerful. It works and it’s free. You’re going to love it. Subscribe now. I could REALLY use these Tips. But great tips, thanks for sharing. I truly hope you did and had a great holiday season Rami. Thank you so much for you nice comment.